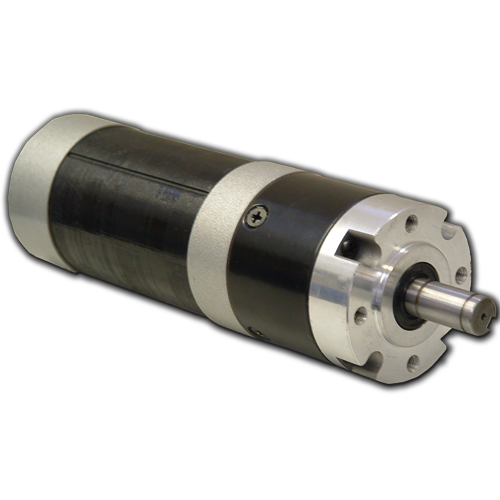 Anaheim Automation's offers Brushless DC Motors that are integrated with a Planetary Gearbox in a rugged, cost-effective package. These round-bodied gearmotors are a perfect solution for applications requiring high torque or speeds from 500 to 15,000 RPM. These star wound motors come with integrated hall sensors for closed loop control for velocity applications. Offered in four sizes, from NEMA 09 to NEMA 23, in up to five stack lengths, providing peak torque ratings from 3 to 6,249 oz-in. Customization to match a specific voltage, current, and/or maximum operating speed, as well as special shaft modifications, cables and connectors, is also available. The cost-effective BLWRPG09 Series are NEMA 09 Brushless DC Motors integrated with a planetary gearbox in a compact package. These round-bodied gearmotors are a perfect solution for applications requiring high torque or speeds under 500 RPM. These star wound motors come with integrated hall sensors for closed loop control for velocity applications. Customization to perfectly match a specific voltage, current, and maximum operating speed, as well as special shaft modifications, cables and connectors, is available. The cost-effective BLWRPG11 Series are NEMA 11 Brushless DC Motors integrated with a planetary gearbox in a compact package. These round-bodied gearmotors are a perfect solution for applications requiring high torque or speeds under 2700 RPM. These star wound motors come with integrated hall sensors for closed loop control for velocity applications. Customization to perfectly match a specific voltage, current, and maximum operating speed, as well as special shaft modifications, cables and connectors, is available. The cost-effective BLWRPG17 Series are NEMA 17 Brushless DC Motors integrated with a planetary gearbox in a compact package. These round-bodied gearmotors are a perfect solution for applications requiring high torque or speeds under 4200 RPM. These star wound motors come with integrated hall sensors for closed loop control for velocity applications. Customization to perfectly match a specific voltage, current, and maximum operating speed, as well as special shaft modifications, cables and connectors, is available. The popular and cost-effective BLWRPG23 Series are Brushless DC Motors integrated with a planetary gearbox in a compact package. These round-bodied gearmotors are a perfect solution for applications requiring high torque or speeds under 15,000 RPM. These delta wound motors come with integrated hall sensors for closed loop control for velocity applications. Available in five stack lengths, customization to perfectly match a specific voltage, current, and maximum operating speed, as well as special shaft modifications, cables and connectors, is also available.